Can you trick your brain into causing your body to shed weight? 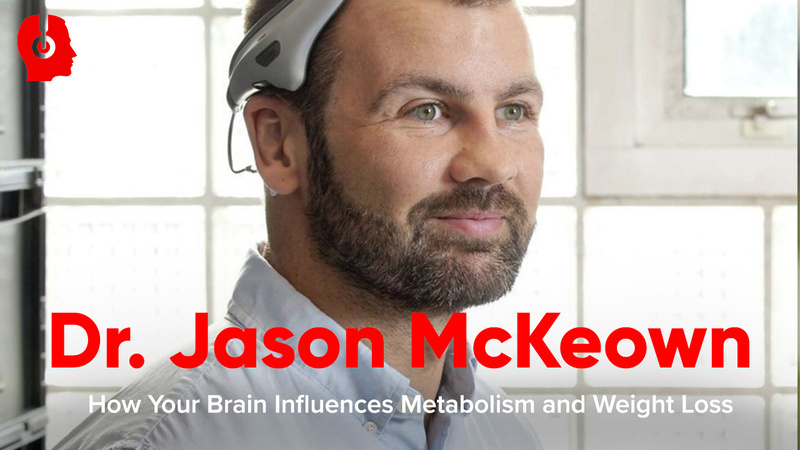 Dr. Jason McKeown from Modius joins us this week to discuss an interesting area of neurology: How the hypothalamus influences metabolism. He believes that the hypothalamus plays a crucial role in how lean you are, your ability to train harder, your hunger levels, and, ultimately, weight loss. This is why he created the Modius, a headset that sends a low-level electrical pulse to the vestibular nerve, tricking your brain into believing your body is moving. He lost 19 pounds and gained 5 pounds of muscle utilizing the device. Dr. McKeown provides a transparent view of how the cutting-edge technology works within the brain and body, citing specific studies and trials (with NASA-associated data that goes back 50 years), making for an engaging and thoughtful conversation. How the vestibular nerve connects with the brain, what it controls, and the methods of stimulating it. How does mimicking movement and tricking the brain translate to genuine weight loss? The evolving space of wearables, with more devices looking to be active (rather than passive trackers) and continually do something to the body. Want to try the Modius Headset for 10% off with a 90-day money back guarantee? Enter the code "HVMN" at check-out on https://www.modiushealth.com/. Geoff:	Hello, welcome to this week's episode of the HVMN Enhancement podcast. This is your host, Geoffrey Woo. I'm really excited to talk with Dr. Jason McKeown, who's the CEO of Modius. I believe there is a corporate name, but Modius is a headset that simulates the vestibular nerve and has interesting outcomes, including weight loss. So, before diving into all of that, Jason is a doctor and a neuroscientist, and is doing good research. I was just looking at some of your publications, and the clinical trials that you were planning. Great to see that you guys aren't just making, at first glance, kind of crazy claims. Like "Hey, we're gonna just zap parts of your brain. You're gonna melt fat off," but looking at it rigorously. So, appreciate the science-driven approach. Jason:	Yeah, thanks so much for having me. Geoff:	So tell me about your background. I know you're a medically trained doctor, but also has interest in neuroscience. How did these two worlds come together, to create the Modius device? Jason:	My background, as you say, is in medicine. So I actually trained in medicine in Belfast, in the North part of Ireland. Then I worked across the UK for some time, actually in various roles. But I was always really, really interested in the neurology, the neuroscience side of it. Actually, I was working in neurosurgery at the time, and when we came up with this idea, looking at ... I suppose really looking at old neuro-technology. So you might have heard of things like deep brain implants, or even implants that go into the chest, and they stimulate the vagus nerve, which goes up to the brain stem. But that technology has been around for 30 plus years. It works really, really well, but it hasn't actually really been improved. Geoff:	What was the end point for the vagal nerve? Was it reducing seizures? What were the goals for vagal nerve implants, or deep brain implants? Geoff:	Right, the shaking. You stop the shaking. Yeah. Jason:	Yeah, it's literally amazing. The interesting thing is that the vagus nerve stimulators, there's actually a really, really wide range. Initially, you'd probably think that some of these things aren't related. For example, a vagus nerve stimulator for epilepsy, which reduces really difficult to treat seizures. Almost the same technology on the vagus nerve, but slightly different waveform or frequency, has actually been approved for an obesity treatment. So that's been around for a few years in the US. Similarly, there are devices for anxiety, depression. There are devices for migraine. Most recently, there's a device for arthritis, or chronic inflammatory disease. It's exactly the same nerve, but it's just the stimulation parameter's changed. So the trick is, in a way, finding the way in to stimulating those deeper parts of your brain, which then actually influence the entire body, all these downstream effects. The vagus nerve technology has been well established, it's phenomenal what it can do. But effectively, they're just stimulating one nerve. Geoff:	So you're a trained ... When you're studying medicine, practicing medicine, that was an area of fascination. What triggered the entrepreneurial light bulb, to realize that you could combine the worlds of entrepreneurship and medicine, to create a headset? Jason:	I think actually that entrepreneurial streak was present before I'd even started medicine. I used to build computers, and sell custom-built PCs for people. I know that stuff seems like pretty standard stuff now, but actually at that time, when I was very young, I was maybe 14 at the time, that wasn't commonplace. I definitely remember back, and have really fond recollection of working with technology, working with electronics. I think whenever this came together and, as I say, I was working on neurosurgery at that time, and we realized that there are these electronic devices. It's such a cool area of medicine, that potentially we could start looking at these and look at ways to make them better. I chose then ... What actually happened, we ... Our interest then was in this other nerve, the vestibular nerve. So the vagus nerve is deep down into the body, lots of applications. But we were actually looking at another ... It's a cranial nerve. Cranial nerve connects directly to your brainstem. There are only 10 that connect ... There are 12 nerves, there are only 10 that connect to the brainstem. Jason:	Yeah. So that's the end point of that nerve, is the inner ear, the vestibular system. But just at, behind the ear, in that ... You can almost feel that, kind of, hard bony part. It's so close to the surface there, that you can actually turn that nerve on and off with just a little electrode pad and a very small, safe level of stimulation. Geoff:	Right, which is interesting. So, mechanistically, why does zapping this nerve do anything? Just from a high level? Jason:	I suppose that nerves, in the general sense, any nerve is really just ... There're action potentials, this was the medical term. But that's really just a little electronic pulse that goes along, and the neurons, in a way, almost act like a wire. In the same way, if you plug an ethernet cable in, or an internet cable into your laptop, you can send signals right along. As long as you know what you're sending, you can access remote computers that you don't even see, or you can't touch. And your brain, to some degree, is no different. As long as we know what we're doing, and you're sending the correct signal to the right place, you can actually influence very deep and very important parts of the brain. Geoff:	So, essentially, a nerve is like an electrical wire that sends signal back and forth between the brainstem, in the case of the vestibular nerve, and with the inner ear components. And what you're proposing, and executing on, is that you can hijack or manipulate that nerve with an external device, in a way that is advantageous for certain outcomes. Jason:	Yeah, absolutely. That is absolutely the case. And it's very, very similar to the vagus nerve stimulators. It is one nerve. It's not necessarily connected to ... You're not necessarily directly influencing the part of the brain that you're stimulating. But as long as you're sending the correct signal along, then you can do really, really amazing things. The vestibular nerve is actually very, very similar to the vagus nerve. So, in theory, it's no different. You can do the same thing. The big advantage is, however, you don't need to go in below the skin, or implant the device. Geoff:	Yeah, which is interesting. I've seen people talk about external vagal nerve stimulators. This is actually the first time I've heard about a vestibular nerve stimulator. But I think the whole space around electricity and brain stimulation has tremendous interest. One of my friends runs a company called Halo Neuroscience, which uses transcranial direct stimulation across the motor cortex, to ostensibly improve athletic performance and muscle memory. I'm just curious to hear your thoughts on the general space. Is there a reason why a lot of the interest is happening now? I have my own speculation around just the broader interest around bio hacking, injuring human performance, but these ... From your perspective on the hardware side, from the stimulation side, what do you sense are the macro-trends driving this interest from academia, industry, into consumer products? Geoff:	Yeah. I'm wearing a smart ring right now that tracks my HRV, for example. Jason:	Yeah, absolutely, and that's not unusual. Whereas years ago it would have been like "What, that's kind of strange." Whereas, I think, just the natural progression of that is, we're moving from the passive wearable devices, which track, into this space where you have active wearables. We actually call our own term: careable. So it's beyond the wearable, it's actually actively doing something to the body. I think the natural progression there is, it's going to be into the neuro component to the body. So it's no surprise that people are interested in using electricity across the cortex, or the motor cortex, or the peripheral nerves, to actually influence really key things in that neural space. Using electricity to do that is the ... I suppose the phrase ... I say "natural," maybe it doesn't sound that natural to some people, but in a way, even if you look at how the neurons fire and how the brain works, that is the natural way to do it. Geoff:	Yeah. So I think for operating in a generally-related space of ... I think both of our efforts are to improving performance. People always ask me, I'm sure they ask you, is it safe? And, does it work? Let's address those sequentially. I think you were touching upon it. The brain is essentially running on electricity, back and forth, with action potentials, as you mentioned. Why is it safe? Have you done the safety studies? What is the safety track record? How is it regulated? Jason:	Yeah. I'll actually come into this probably in a little more detail. But, actually, it's not just a sense of balance. I think this is where we've assumed that it's less than it was, for a long time. It is actually a marker of physical activity. Whenever you move, whenever you accelerate, you're constantly stimulating your vestibular sense. It gives your brain, particularly your hypothalamus, it gives it a reference of how physically active you as a person are. The reason it does that is because ... I'm sure you're aware of the term homeostasis, it's kind of the balance of things in the body. So we're interested in the metabolic balance, like energy consumption versus energy storage. Homeostasis is actually altered by the hypothalamus, and it takes many readings. It takes the reading of your vagus, central input from the body. Things like leptin, and ghrelin, and insulin, and your parasympathetic and your sympathetic, all of that. And it makes, I suppose a ... It balances out homeostasis. Geoff:	Which gets me thinking. Can you hack it by ... If we take the thesis that the vestibular system is a signal for physical activity, can you just shake your head a lot and try to ... Not actually exercise, but just trigger movement to hijack that signal? Jason:	I'll ask a question. Why do you rock a baby? Geoff:	Yeah. From some reason it soothes the baby. Jason:	Yeah, so we know that rocking a baby actually helps it to sleep, and it settles it. Now, we know that in elderly nursing homes, that if you put in rocking chairs, it decreases anxiety, it decreases agitation and falls. And this is the reason why. That is actually an effective way of hacking your own vestibular system. It's also why some, particularly children, who maybe have ADHD or some learning difficulty, is they tend to rock back and forward. Again, that is them actually forcing their vestibular system to fire into their brainstem. So the answer is yes, you can hack it. Geoff:	So basically we've been already doing it. Okay. Jason:	We already do it. Geoff:	Is that published? Is that searchable online? Jason:	Oh yeah. Yeah, yeah. Geoff:	So just ... What are the keywords? Like NASA, vestibular simulation? Jason:	Yeah. To be honest, I actually have ... I'm generating my own academic site now, with breakdowns of all these papers for the lay person. So if you wanna check out my own, personal, let's say, academic site, you'll be able to read all of these. Jason:	We presented this to the lab out in the University of California. Long story short, they actually invited me out to take a visit. It's just to do vestibular nerve stimulation, and try to find what parts of the brain it improves, and can we get applications for this. They're actually really, really wide. From yes, we're really interested in weight loss and changing metabolism, but it goes right across to the mental health space. That's why people can rock back and forward, it actually creates a very positive effect on this entire cortex. Previously, they used to spin people around in a chair for things like depression and mania, because actually it settled it in a quite significant sense. But their nest spinning idea went old fashioned, whenever medications and antidepressants came around. Geoff:	No, no. I think it does set the context well. Is that, this is something that has been experimented with, and it's a kind of a natural phenomenon. People intuit that rocking themselves, soothing themselves, has some sort of soothing effect. Geoff:	So I guess the natural next question is: one, people already are, with their physical body, stimulating their vestibular system. Now the next step is, can we, using an external device, stimulating that nerve directly with electricity? Is that safe? Jason:	Yeah. No, absolutely. Parallel to this, actually, the technique of using electricity to stimulate the nerve has been known for a long time. It just hasn't really needed ... Passed any laboratory experiments. We actually have a significant amount of safety data on, specifically, stimulating the nerve using electricity. It's so much data, in fact, that we were able to really make the case that this doesn't have to strictly be regulated as a medical device. We could go straight to the consumer device. If we weren't able to show that that were a safe device, there's no way would we be allowed to go into that consumer space. It really created two parallel paths for us. One is that we wanna have the device as an approved, prescribed device in the future, for not only weight loss, but actually we're interested in type 2 diabetes as well. It's all due to vagus nerve stimulation. The other path is the consumer weight loss device. So, if someone is wanting to try to improve or use a tool to make their weight loss journey easier, well then that's why we've created the headset. Geoff:	Yeah, no, that's interesting. I think that's eventually an area that is gonna get more clarity in the future, with how regulators treat devices that have potential medical use. Which is a very defined set of: treatment, diagnosis, prevention of disease. Like type 2 diabetes, for example. And then health and wellness, and then enhancement, which is "You're healthy, can we improve yourself." It sounds like you are working on both parallel tracks, which is what I think ... Me personally, just getting deeper and deeper into human performance, it's just two sides of the same coin, ultimately. Ostensibly, if you're healthier and more optimized, you're gonna have less ... Prevent, or pushed out, thee onset of disease, and vice versa. Jason:	Yeah. The way I would look at it ... And sometimes I think that people ... This idea of wellness, it's slightly ill-defined, and some people really don't realize what we mean by that. The example, that I would often give, is there are binary things in medicine. For example, if you fall and you break your leg, your leg was fine before, and your leg is now broken. It's a very binary thing. There was no period in the middle, where your leg was slowly beginning to get broken and then, at some point, it crossed over into being a broken leg. But actually, not a lot of medicine is like that. Obesity is an example, or I would often use mental health as well. If you imagine you ... Someone here is fine, but someone over here is in the obese state, there's actually been a transition period, where they went right along. In some of this, there was no disease process, as such. But then over here, at some point, this has become a chronic disease. It's the same thing with mental health. There's the space in the middle, where your mood is low, or maybe then you're more anxious, but you haven't really reached a chronic state. At some point, you're beyond that. Traditional medicine almost waits until you reach this state and, in my mind, that's too late. We should actually be treating this pre-disease, or the wellness space. So for us to have a product in this chronic disease, chronic obesity space, but also have a product, which could potentially prevent people ever getting into that space. For us that's just really, really exciting. Geoff:	... We have set an arbitrary number, Like a 100 milligrams/deciliter is such an arbitrary number, like 5.7. Why is 5.7% H1BAC different from ... Why can't it be 5.2? Or 5.9? Geoff:	It's just ... I think there's some epidemiological data around "Okay, that seems to be a cutoff before it gets dangerous." But if you actually look at the first principles, these are not God-defined numbers. Like you're officially ... The arm is broken. I think that's what it's all about, can you prevent or maintain an optimal state longer? Jason:	Absolutely, I totally agree with that. For us we see two, if you're trying to broadly break it down, two challenges. It's preventing people who are well reaching a state of being unwell. Or, in our case, say it's obesity, it's preventing people who are maybe starting to gain some weight, preventing them actually ever getting into an obese state, or a type 2 diabetic state. That is one challenge. The other challenge is, for those people who are already there, it's trying to, if not reverse it, it's trying to manage that and make that better. Make life and wellness better for those people. Geoff:	Right. One point is that ... Now, assuming that vestibular simulation is something that we do as animals, just intuitively, to when we can stimulate this safely. The third question would be: how do you know the waveforms, or the signals of electricity, to actually do the right thing? I can imagine that you send the wrong signal. You do overly-high voltage or amps, you might do the wrong thing. So how do we understand exactly types of waveforms, and energy levels, to actually send? Jason:	That's a great question. That's something I've put a lot of work into. Again, it's something we've really taken into this role of ... If we're gonna go down a consumer path, we really need to know that we are doing ... This is a safe device that people can use, and they're not gonna get side effects. Some of the actual work previously that had been done, was on what levels of stimulation actually create the greatest response. There's some really interesting things here. The changes between, say, a high frequency and a low frequency, are actually quite pronounced. It's actually whenever you come down into the low frequency range, that you start to see spikes and sympathetic muscle activity. So, even though you're stimulating your vestibular nerve, you can actually see the sympathetic muscle activity increase in as far as your calf muscles. Geoff:	So what are the hertz, when you say low? What is high? Geoff:	So this is a slow pulse? This is once every two seconds, if it's 0.5 hertz. Jason:	And because we actually ... We designed it to switch polarity, and move around. It's just so that you don't accommodate to it. So you actually feel it. And whenever you turn the device on, you can increase the power level. We set a max power level for the consumer device, the medical device actually is a bit higher. But the consumer device, whenever you reach the threshold for it's activating the vestibular nuclei in your brainstem, you actually feel like you're moving. Your brain can't tell the different between a natural signal, and the signal that we relay. Geoff:	That's interesting. Is mimicking, like moving every two seconds, is what we're suggesting? Jason:	It feels ... It's actually great. It's nice. It's like lying on a isle in the swimming pool. It feel like you're floating, kinda rocking back and forward. We find most people wear this last thing at night, because it makes them very relaxed. There's a thing called the soporific effect, it's actually part of vestibular simulation, and that actually induces sleep. So we find that most people wear this just before they go to bed, because it vastly improves their sleep. Which is technically a side effect of what we're doing, but is also ... It's obviously a very positive side effect. Jason:	We're actually looking across of a various range of pulses, but not dissimilar to what you're describing. I don't want ... Just for a commercial reason, I wouldn't want ... To this specific details. Geoff:	It's not as easy as: signal on, signal off. There is some art to the signal waveform? Jason:	Yeah. It's ... Yeah, there is. The waveform itself we've sort of custom-generated. It's similar with the vagus nerve stimulator, so there's lots of range of waveform, but you really wanna optimize it. I'm sure various waveforms would get various effects. But, as I say, our goal with this device certainly, is to optimize the metabolic output, or the autonomic output, to actually try and really make it easier for people to lose weight. Geoff:	Okay. So the main endpoint for this particular device is weight loss, which is one of the most desired attributes, and broad consumer health and wellness. It sounds like, if it works, it's something that's really compelling for a number of folks. So, going from stimulation, and then mimicking movement, how does that get to weight loss? Jason:	It's to do with the nuclei in the brainstem, and then the hypothalamus, that are actually influenced. Your hypothalamus is, as I say, the cornerstone of your metabolism, your physical structure. So your muscle mass, your bone mass, your fat storage. Your hypothalamus takes signals from all parts of your body, as I was mentioning some of them earlier, and it looks at what it thinks is homeostasis. It wants to maintain a certain level of balance with fat storage, versus how much energy you're using, or how much energy you need. There's a range that your body sits inside, and typically it fluctuates a little, maybe a few pounds, and you don't think too much about it. Some weeks you'll be a pound or two heavier, some weeks you'll be a pound or two lighter, but roughly speaking you stay at a fairly constant level. Geoff:	So you're talking about a set point. Your natural weight set point creeps up, as you slowly gain weight or slow down your physical exercise. Jason:	Yeah. We call it the set point, but it's more of a range. It's not like a really rigid ... There's quite a gap. Actually what happens is, within that gap, people tend to lose a few pounds, and they go down towards the lower end of the range, and they'll hit a bit of a plateau. That plateau is the hypothalamus stopping any further weight loss, and it will do that by making your desire to eat be insatiable. You'll never feel full. Your metabolic rate could slow right down. Even your core temperature can go down, just to try and preserve fat storage. Geoff:	They give up. They give up, right? Jason:	Yeah, they give up. Geoff:	You're fighting at the set point, but you need to create a new set point. It takes your body ... Your body needs to adapt to a new set point. Jason:	Yeah, and that is exceptionally difficult. And I say ... Sometimes I get quite frustrated, 'cause of all the people would come back to us and say "We're just giving people an excuse not to try." That is complete nonsense. People try really, really hard. It is just too much. And even if you do eventually get down, if everything internally hasn't readjusted, then you're fighting against that for such a long time that, you have one bad weekend, and loads of weight piles back on. Then people just get so disheartened, that they give up. So what we're doing is, we're trying to influence that part, so that plateau ... We know what happens, we know what parts of the hypothalamus actually influence that. We also know that the vestibular nerve goes in through the brainstem, and actually projects out into various areas of the hypothalamus. If you're to split it down, there are key areas. The vestibular system actually connects into those key areas. So what we're doing is, just repeatedly stimulating the vestibular nuclei in the brainstem, which sends the signal into the hypothalamus so that, whenever people start to decrease the weight, that actually that plateau ... Hopefully it is ... If it were totally gone, would be fantastic, but realistically, it's just making it easier for people to get down further than they have gotten before. Geoff:	Yeah, yeah. I can see how a mimic of physical movement through the vestibular nerve can be a contributor to that. I think it would be an overly stretch to say you can totally mimic the benefits of physical movements and exercise, right? Geoff:	I don't think you're claiming that. But we are assisting your brain, and mimicking some of the effects of resetting your hypothalamus. Jason:	I think that's absolutely the crucial part of this. It's not to, I suppose, mimic the actual force of physical activity. It's not like firing your muscles over and over again. It's actually just letting your brain know again that this is a physically active body, it is storing too much fat, so allow fat storage to go down. Whereas if that's not happening, your hypothalamus is always trying to keep fat storage higher. We're trying to overlay the signal of "Yes, fat storage can go down." Geoff:	Yeah. I'm just wondering, 'cause the human physiology is a very complex system, so I'm just curious what would be other downstream effects? If you're not actually doing physical exertion, necessarily, but you're tricking or mimicking some effect of physical exertion in a certain part of your brain. I'm just wondering would that put ... It would be in fairly novel physiological state. Which is not necessarily a bad thing. It just, I'm sure that ... I presume it's part of what the continued research is, to understand the full, cascading effects of something like this could entail. Jason:	Yeah, our interest is really what happens in the, what we would call, the entire autonomic nervous system. The parasympathetic is one side, your rest and digest, and your sympathetic, your flight or flight. Actually those two are ... A lot of people think they're a bit like a seesaw, and as one goes up, one goes down. That is true, but the entire balance itself can also shift. That is ultimately what we are trying to, I suppose, modify, but in a positive way. Geoff:	Okay, insulin sensitivity. Interesting. Jason:	Yep, yep. Or your baseline glucose levels ... Sorry! Just a disclaimer there. That is about vestibular stimulation in general, so just the field of vestibular simulation in general. I'm not saying our device is indicated for that. Modius is just indicated for weight loss, but the research ... The academic research that I do in this field, we've actually seen all of those downstream changes. The other thing, which is actually really well known, is ... And this is a bit of a test for us, because if what we're saying is true, the entire umbrella of metabolism should change. It shouldn't just be that you lose non-specific weight. If anything, you should actually see an increase in muscle mass and in bone density. All the animal work shows that. If anything, there's probably been more work done on the bone density side of things, than the work that actually we've done. Jason:	And, it's collectively that whole thing is what's influenced. That whole autonomic control or all those downstream effects. As I say, if that weren't the case, then you might just see non-specific weight loss, There's a quick test that you can do to see that we're changing metabolism. Not just making people not eat as much food, and then they lose weight in general. Geoff:	Right. Even reducing adrenaline through stimulation could be interesting, but if it is what you're saying, which is a whole cascading across, effect across all of metabolism. That's something that is interesting. I wanna talk about that, but I wanna ... Before talking about that, so what is the human data for weight loss? I presume you have case studies. Do you have a published RCT on this? What is the human data backing the weight loss? Geoff:	And it's lower ... I believe that CO2 ratio means more fat ... More depth to the fat metabolism. Geoff:	It's some ratio. But I know what you're talking about. There's basically ... By the ratio of CO2 output, you can tell whether your body is burning more sugar or more fat. But I ... Okay. Jason:	Yeah. And then the other part of that is saliva, insulin and leptin, and just general subjective score. Geoff:	So you have three cohorts out of ... So N equals 10 for each cohort. Geoff:	And you're doing placebo-backed or crossover treatment? Geoff:	They were wearing a device, I guess, but nothing was going on. Jason:	There was no ... Yeah, no delivery. Yeah. Geoff:	Okay. And then ... Okay. Geoff:	Phase 1, 2, phase 3, yeah. Jason:	Yeah. The purpose of the pilot studies, really, just see is it worth proceeding into the larger studies. We actually did see changes across the all of those, the positive changes. Even a modest dose, was like three times a week, we were able to see reduction. Particularly central fat, in that group. Albeit, they're a pretty small group, but central fat is what primarily was reducing. Also, increase in fat oxidation, or fat metabolism. And saliva insulin and leptin, actually, we would see both changes in those out of fasting, kinda pre-breakfast diet. And then, at that time, the device will also give you a slight decrease in the appetite. So these guys were pretty hungry pre-breakfast but, as hunger increased, with the set on, the hunger sort of plateaued. Then you take the headset off and it starts to increase again. Geoff:	Is this peer reviewed and published? Or is it posted on a website as a white paper? Jason:	We're just on a white paper now. But, as I said, the real purpose of that was to step into full trials, which is where it's quite interesting now. Over the next year, we'll probably have about 300 or so people through trials. That is a year-long, wearing the device, double-blind, randomized control. Half of the group have just sham headsets. That's a multi-centered trial. We have a site in California, we also have a site in the UK. And also, this is quite interesting, we're actually setting up a pediatric trial in middle America as well. Geoff:	Wow. Three hundred over a year is not cheap. That's something that we, ourselves, understand the costs associated with that. Are you self-funding? Do you have research grants from foundations? NIH? Jason:	Yeah, we do ... Both, actually, to some degree. So we do have funding in place from the company, and I'll talk about how we got that. And then also, we're looking at research grants. The areas of weight loss and type 2 diabetes is a really important area, so there are some facilities available for that. The idea there, is to have this as an approved weight loss device, primarily in adults in the US. That you can get on your insurance, or your doctor would prescribe for you. And then we were looking towards some sort of preventative, maybe pediatric-type device. Further to that, we would expand it into the area of type 2 diabetes. Because, not only is there the indirect effect, where you lose weight, your diabetes will improve. But there's actually a direct effect, because, particularly in the pre-diabetes state, because you have that autonomic disfunction and it's because your vagus nerve is going down into your pancreas, actually you can get a direct, neurological influence by stimulating the brainstem. That ties the influence of what the vagus nerve does, and you can potentially increase, for example, you mentioned sensitivity, or improve insulin output from a pancreas, which isn't performing. Geoff:	Right. Which is interesting, right? If you're saying that you're seeing ambient insulin levels reduce off of a pretty short treatment period ... that's interesting. Jason:	Yeah, no. The field is really, really interesting and, I suppose, that is one very well defined medical area. Then, also what we realized was, the FDA have a category called the wellness category. Because we're actually a non-invasive device, we were able to say "This is very low-risk device. Here's all this previous peer research, talking about showing this." Also, rather than saying that we wanna treat obesity, we really just want this to be an end for people to actually to lose weight. So people who are trying to lose some weight, this can help them, or it can be a tool. So actually, that is Modius. All that other stuff we talked about, that's very much a medical, very distinct device, which we haven't released yet. But Modius is the weight loss, or weight management device that a consumer can buy. Geoff:	No, I absolutely understand the importance there. Not talking anything about medical device, medical treatment. This is all ... We're talking about the science, and the research active going on there. But in terms of the commercial product, this is a consumer, generally-regarded as safe-type intervention. Jason:	Yeah, so it's in the wellness category. It can be purchased by every consumer. I say, just our team ... Whenever we realized this ... One thing that we were really open and honest about was that "Yes, in the lab and the theory, it's all pretty good." But it's still a pilot study, at the end of the day, and it's a relatively modest size. What actually happens when you open the device up to the consumer market ... What people who have comorbidities, people who are on medication, people who have stressful lives, there's just so many influences on weight, what actually happens. So we went onto a platform called Indiegogo, it's a bit like Kickstarter. Geoff:	Yeah. Crowdfunding or ... Yeah, yeah. Pre-sales. Jason:	Went out to say "Look this is ... We want guys to feedback to us. We'll give you the device. Really, [inaudible 00:43:48] price. But for a period of 90 days, feedback to us. At the end of 90 days, if you're not happy, we will 100% give your money back. There's no questions asked, we're not trying to catch people out. Literally, you don't even have to give us a reason." If they give us the device back, we'll give them their money back, because we just wanna know how this performs. We set our target at 50,000 dollars on Indiegogo, and I think we hit 50,000 dollars in four hours. Within a week, we had hit over a million dollars. So we actually had to try to slow it down a little, but that's still increased. We actually ended up raising over two million dollars. Jason:	That's fantastic, and that's where some of the funding for the trials, obviously, has come from. But a really important thing from that, is that we have data from that group now. So, that group are actually starting to come through, and we were able to deliver pretty quickly. We're now getting the group who've passed that three month point, they're into three, four, five months. So we're getting some really, really great data, from around 4,000 people or something, there's probably feeding back to us. Geoff:	So I gotta ask: how often do you wear it? Geoff:	What was the time span for that kind of outcome? Geoff:	Which is water displacement? Jason:	Say that again. Sorry. Geoff:	Is that water displacement? Jason:	It's the same principle, but it's in an airtight container, so they actually just displace the air. Jason:	But it's basically the same principle. Jason:	Yeah, so I had really positive effects. I'm actually now using our second device, which is in the mental health space, and it's ... I mean, my mental health is fine, thankfully, but it's just because I really love the idea of trying. I wouldn't ever tell someone that you should try this, without me having tried it for a long time. So, quite excited about that as well. Geoff:	Very cool. One of the interesting things from our community is that we're ... A lot of our listeners are interested in intermittent fasting, indigent diets. It sounds like there is an interesting crossover with some of the end points that you're seeing, with reduced insulin. Obviously, one of the reasons ... Multitude of reasons why one would intermittent fast, eat keto, but is to treat ... Prevent type 2 diabetes and metabolic syndromes. I'm personally interested in how fasting, exogenous keto, and keto maskers, is something that we're bringing to the market. How these things all stack together? 'Cause I think if you ... I'm actually just curious. Do you wanna experiment if you just wear your Modius, and you wear a continuous glucose monitor, would you just see your blood sugar drop? Or do you finger prick to test ketone levels? Do see ketone levels potentially go up, as your glucose drops? I think there's a multitude of the things to look at, as a cool intervention. Jason:	Well, anecdotally now ... This is just some feedback that we've had from our community members. We've had a significant amount of people coming back to us, type 2 diabetics, and they've been able to adjust their medication in a pretty short period of time. Particularly they also take insulin, so they've been able to decrease the dose. Then, we have all the reports just of more stable ... A lower, but more stable baseline. So, even if they have a bad weekend, their blood sugars aren't going crazy like they used to. So I think this all fits in very, very well. Again, I think it's because it's that top level, that autonomic control. So, rather than adjusting something lower down the chain of command, if you actually go up and influence the hypothalamus at the top level, then, I say, that's where you see the real benefit. Geoff:	Very cool. I know that we have a special offer for our listeners, right? So, do you wanna explain it to our listeners? Jason:	Yeah. If anyone's interested in the Modius device, they can buy directly from modiushealth.com, but we're offering your listeners a promo code. I'm not sure, do you put it up on the screen, or? Geoff:	Yeah, we'll put it up on the screen. But it'll be H-V-M-N, human, as a promo code for a 10% off on the order. Jason:	Yeah. Basically, put in the promo code, you get your 10% off. We actually include ... The whole pack comes with three months-worth of pads and little wipes, just to take some of that oil off the skin. Also, although we're a UK-based company, we do free shipping to the US. It's pretty quick turnaround. It's usually ... I think I see some guys have had it next-day deliver to the US, but it's usually 2-3 days, so it's pretty quick. But definitely put the promo code in, and get the discount. Geoff:	Awesome. It sounds like a very cool intervention, that's thoughtful and rigorous behind the science, and evidence behind it. Appreciate the good work here. I think it's a fascinating, just broad space. From this conversation, and my conversations with other operators, scientists, researchers, there just seems to be ... I don't know if it's an ideological discussion, or debate, or a cultural debate, but there's this ... Always this skepticism or this "I don't believe you-type critique." Which I think is fine. I think we should all be skeptical coming in. But if we're doing the actual studies, producing actual data, doing the actual science, and it's safe, and we have good signal that this is actually efficacious, it's a worthwhile goal to pursue. Jason:	Absolutely. One thing that ... When I started, I probably didn't realize just how important this was. The risk profile in that has to be number one for us. We would highlight again: this is a really, really safe, it's a really, really low-risk device. And the reason that we say that is, we just know with weight loss, it's such a difficult, multi-factored issue. We know for a fact, and we're really open and honest with this, that the device will not help everyone. So we don't want people going in, thinking that they're doing something risky, and that it might not work out. That is absolutely not the case. It's very, very low risk. Thankfully, we're actually seeing about 80% of people, who are regularly using the device, actually achieve a significant amount of weight loss. So, that is fantastic. And, as I said at the start, if people feel that it just hasn't helped, it's not that we're going to try and keep their money. We will happily give them their money back. Even if it has helped, if they've lost loads of weight, and they still want the device back, it is not about that. It is about us really trying to make a big impact here, and for those people that it works, causing it ... Significant amount of weight loss. And only just trying to make this problem easier for a lot of people. Geoff:	Well said. Thanks for taking the time, and sharing about your work and research, and talking about Modius. Appreciate the time. Cheers. Jason:	Excellent. Thank you so much for having me. Help us make the podcast even better. Contact podcast@hvmn.com with any feedback, questions, and guest suggestions! Write a review for us on iTunes, let us know via email, and we'll send you a free Sprint Mini.